The new adidas x Wanderlust line features material made from recycled water bottles. Wear it in good conscience. Pictured: the adidas x Wanderlust onesie, made with Parley threads. It’s a serious issue—just ask Emma Watson, who showed up to the 2016 Met Gala wearing a dress made entirely of plastic bottles (not that Met Gala outfits can necessarily be considered fast fashion). Thanks to the Wanderlust x adidas apparel line, plastic bottle outfits aren’t only reserved for high fashion celebrities and red carpeted balls. You can don your plastic bottles to your favorite studios—or to your favorite festivals—and literally wear your bleeding heart on your sports bra. adidas teamed up with Parley for the Oceans to co-create fabrics from Parley Ocean Plastic™, a material created from upcycled plastic waste that is intercepted on beaches and in coastal communities before it reaches the oceans. Some of these products are included in the adidas x Wanderlust co-branded apparel line. This effort not only helps to spread awareness about ocean plastic pollution, but also to take meaningful action against it. When large voices like adidas take action against social or environmental issues, the potential for change is significant, to say the least. “We have already taken the first steps to reduce and ultimately eliminate virgin and single use plastic from our products,” says Eric Liedtke, Executive Board Member of adidas AG, Global Brands in a press release. “In doing so, we have shown that it is possible, and that people care—but now we must accelerate and scale,” states Liedtke. adidas and Parley aren’t alone as large companies carrying the environmental mantle; even seemingly surprising companies have made widely-publicized decisions to carry organic products, for example, or to adhere to carbon offset programs and emission reductions. As a certified B Corporation, Wanderlust, too, is committed to taking action that encourages and promotes sustainability—how can we ask our festival attendees and staff to Wander Without Waste, for example, if we don’t practice what we preach when it comes to what we’re sell and with whom we partner? To repeat just in case it didn’t sink in: Americans produce 13 million tons of textile trash every year. Nearly every piece of clothing that Americans own gets thrown out. Every article of clothing can take significant time or resources to construct if made from virgin (non-recycled) material. We hear a lot in our community about working toward food sustainability by “voting with our fork”—making choices that support and work within our personal value systems. The same principle can be applied to the clothing we purchase. If every person in America committed to buying only recycled clothing, not only would there be a reduction in energy and resources needed to make it, but the demand for recycled textiles would go up. Big change can begin on the smallest scale. Many personal commitments to environmental practices and sustainable living were spurred by a personal love for the Earth. Maybe you’ve already made the commitment—or maybe you’ll come to it on top of a mountain at a Wanderlust Festival, on a hike with your family, or simply while driving through breathtaking country. Wherever you are in your journey toward sustainable living, you’re on the right path. We only have up to go. Lisette Cheresson is a writer, storyteller, yoga teacher, and adventuress who is an avid vagabond, homechef, dirt-collector, and dreamer. When she’s not playing with words, it’s a safe bet that she’s either hopping a plane, dancing, cooking, or hiking. 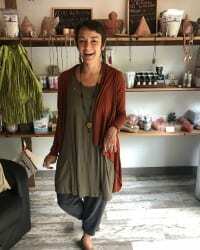 She received her Level II Reiki Attunement and attended a 4-day intensive discourse with the Dalai Lama in India, and received her RYT200 in Brooklyn. She is currently the Director of Content at Wanderlust Festival. You can find her on Instagram @lisetteileen.